This class is designed specifically for the needs of the new mother and her young child, providing a safe, rewarding and fun environment that can help you regain fitness and strength, while also interacting with other mothers and their babies. 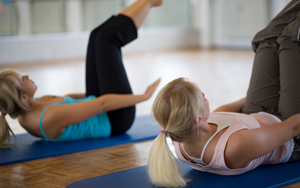 The classes are run under the guidance of a professional physiotherapist, to ensure that the pilates exercises are safe and are suitable to be performed, as your body is recovering from the physical strains of pregnancy and childbirth. Max 4 per class: $500 per block of 10 classes. Rehabilitate and improve core muscles (including the deep abdominals, deep back and pelvic floor muscles) co activation and endurance. Reeducate appropriate postural corrections in functional positions like standing, sitting, lying. Improve physical condition to cope with demands of the post natal period such as with lifting, breastfeeding postures and repetitive bending tasks. Provide new mothers with exercise ideas incorporating participation of their young baby, which can be followed through as a home exercise programme. Prior to participation in these classes, it would be much appreciated if you could complete the relevant assessment questionnaire to ensure that these classes are appropriate for you. In some cases, you may be required to attend a half hour one on one pre class assessment with one of our physiotherapists, and/or provide us with a letter from your doctor to certify that you have been cleared medically to commence an exercise class.